Cleanroom furniture is ideal for use in semiconductor, bioscience, pharmaceutical, and board manufacturing. A clean room chair should comply with ISO cleanliness standards and each one we carry has been tested by an independent testing laboratory to assure compliance. We have cleanroom chairs with vinyl or polyurethane seat materials and base materials of aluminum or plated tubular steel. 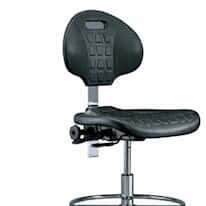 Added are pneumatic height adjustment and 360° swivel for comfortable positioning.